Autumn has to be my favourite season fashion-wise. The mix of weather that we get in the UK in Autumn means that the vast majority of the items in my wardrobe can be put to use in the season - especially if you're clever with how you wear things. I got the chance to take a peek at the Boohoo A/W12 Lookbook - it really reflected my own way of transitioning from Summer to Autumn and from Autumn to Winter. 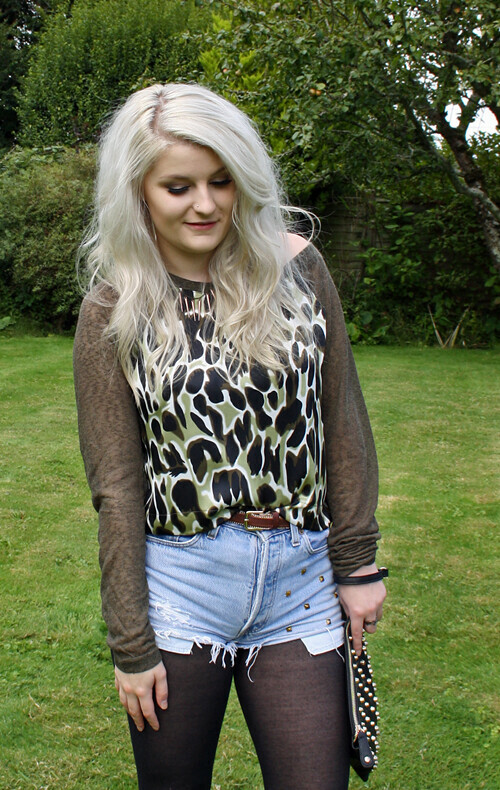 Boohoo have so many pieces that are ideal for layering (I love a good bit of layering!). Here's Boohoo's guide to A/W12 trends. My favourite is Utility Luxe as I'm really into khaki at the moment! It's worth checking out their New In page too if you're looking to add to your wardrobe for this season, as new pieces are being added constantly! Onto the outfit - I'll start off by saying I love this top. It's such a brilliant buy for £18. It's one of those things that look good on the website and even better in person. The sleeves and back of the top are a fine knit, with subtle elbow patches and a dipped hem back. The front panel is opaque and silky with a leopard print, the shades of the print are so gorgeous together in this khaki version, but it's available in black too. Gorgeous! I love your hair and those shorts! I really love this outfit its so cute yet perfect for winter!! Totally cute, love the bag! Your style is so fierce! Love this entire outfit, and the accessories! fab look! I love the certain edge of it! and your clutch is beyond precious! P.S. guess what - I'm your newest follower! Love your top, so cute! You look gorgeous and I must say your hair is flawless!! Love those boots by the way! I loove Boohoo! Wished I lived in the UK though! Gorgeous outfit your hair looks so amazing here! Swit Swoo Robyn! Your hair looks amazing!